here’s a hint, it’s not quite mint. After painting the tall mid-century modern piece in a neutral dark grey last week, I promised myself that I would go for a more daring color on its companion piece. I have to confess, I almost backed out of that promise when I saw how amazing the taller piece looked in the dark grey. But I stuck to my guns and went for a brighter color on the low piece. Can you guess what color I went with? And no, it’s not mint! Yep, I just had to choose Fusion’s Park Bench. It worked so beautifully on the last mid-century piece I painted and that piece sold in just over 24 hours, so I decided to see if I could repeat that experience. The prep work on this piece was exactly the same as for the taller one. I had to re-position the drawers so that they were inset once again, but other than that it was ready to paint thanks to the sanding and repair work that the previous owner had already done. 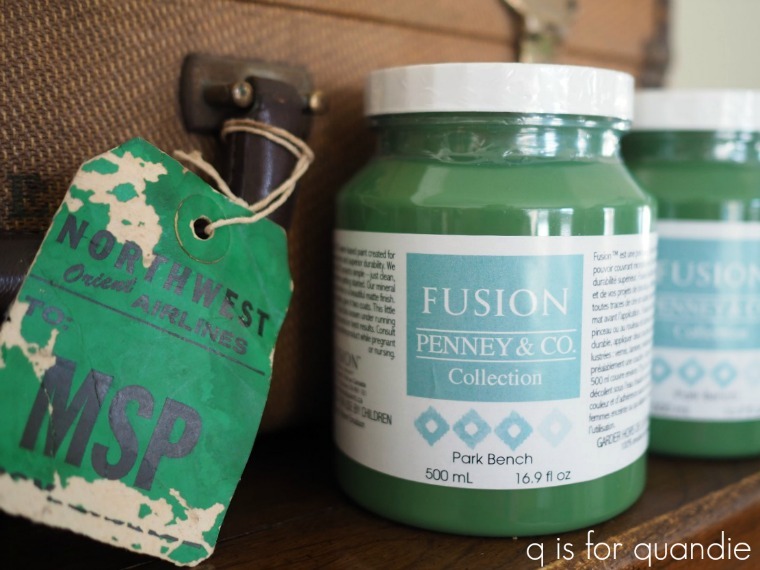 I really love painting a large piece like this with the Fusion paint mainly because it cuts out one major step in the makeover process, having to add a top coat. Fusion paint has a built in top coat. After curing for about 3 weeks or so, this paint is fully washable and water resistant as is. You’ll often see people adding a top coat, and you can add one if you want to, but you don’t need one for durability. 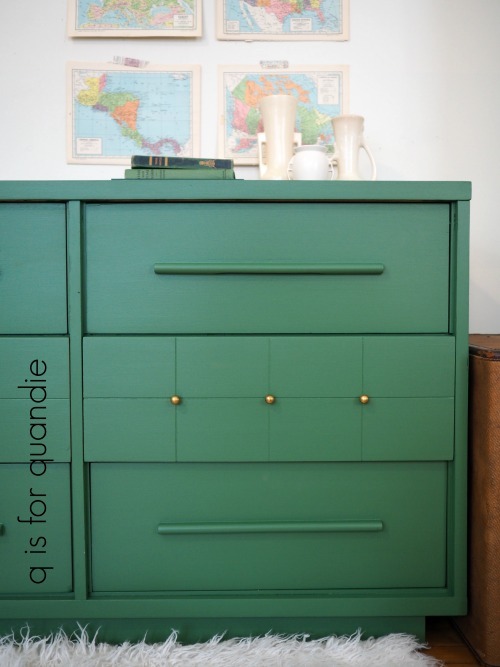 I love this gorgeous shade of green! 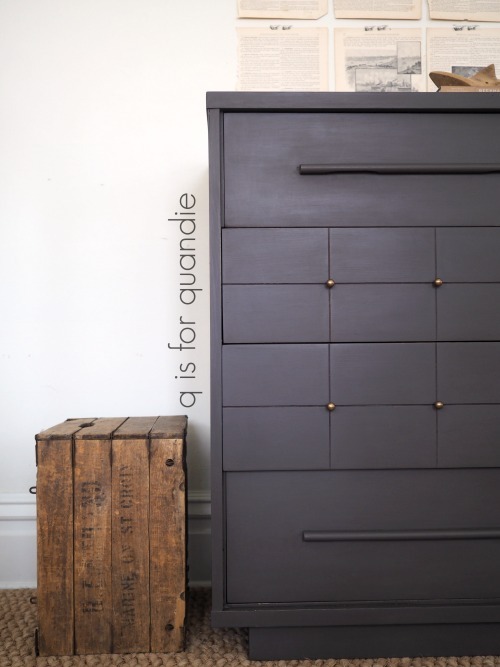 On the taller dark grey dresser I used Prima Marketing’s Metallique wax in Bronze Age on the knobs, but for this piece I wanted to go with a brighter gold so I went with their Vintage Gold Metallique wax. Now it just remains to be seen if this green appeals to a buyer too. Fingers crossed. If you are local and would like more details, be sure to check out my ‘available for local sale‘ page. Previous blondes have more fun. Next a pair of french chairs. Paint brought such an AMAZING difference to those pieces…great job! I love this color, it does remind me of park benches! Honestly I think this will sell quickly for someone to use as a console for their TV or as an entry way piece. This is right up the alley for someone who loves Anthropologie. Great job and nicely painted. If you deliver this, take a photo of it in the new owners home! Hopefully I won’t be delivering this one 😉 But you never know, and if I do I’ll try to get a pic! I love it! It’s timely for St. Patty’s with green and gold 🙂 I think it’ll sell quickly as well. So cute! True! I have to keep reminding myself the March is right around the corner, and then … spring! 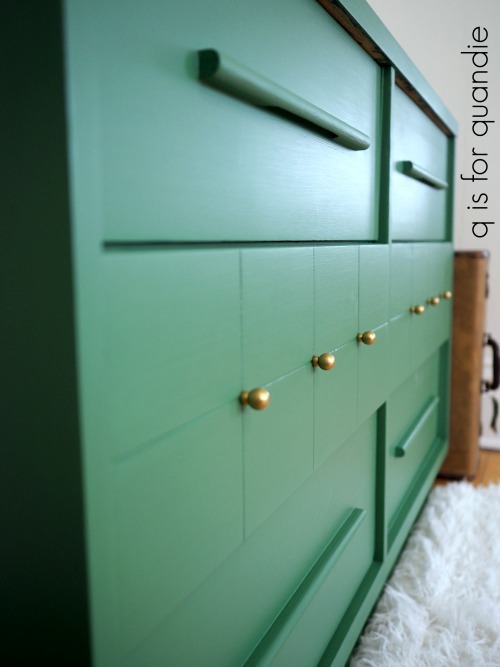 I just LOVE this color, it looks so awesome in this dresser- it won’t last long I’m sure!!! It is such a gorgeous shade of green! Gorgeous! What a stunning sideboard or foyer piece. Or how cute would it be in a nursery?? Love the green with the gold. Great job, Linda! I can totally picture it in a nursery too Cynthia! 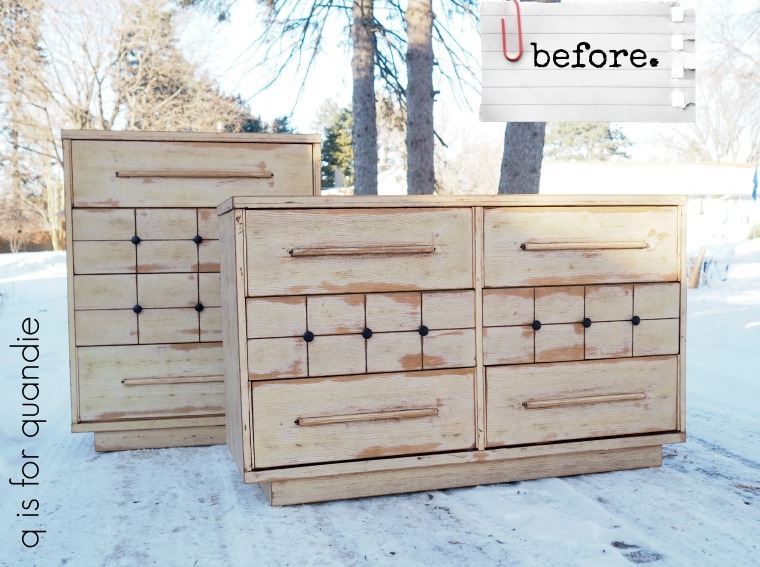 Perfect to use as a changing table now, but just a dresser later. I love the color. Green is one of my favorites. Not a fan of mid century modern pieces, but you did a great job on both of them. 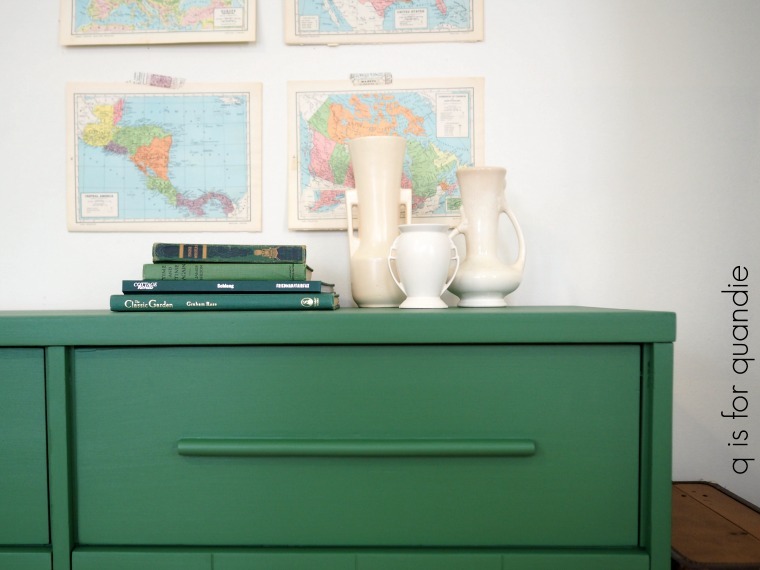 I love the MCM furniture and the ” preppy” green. Awesome as always! You’re so right with the ‘preppy’ Cilla! This totally preppy green. It just needs some pink beside it for proper preppy-ness. Or royal blue would look great with the green for masculine vibe. 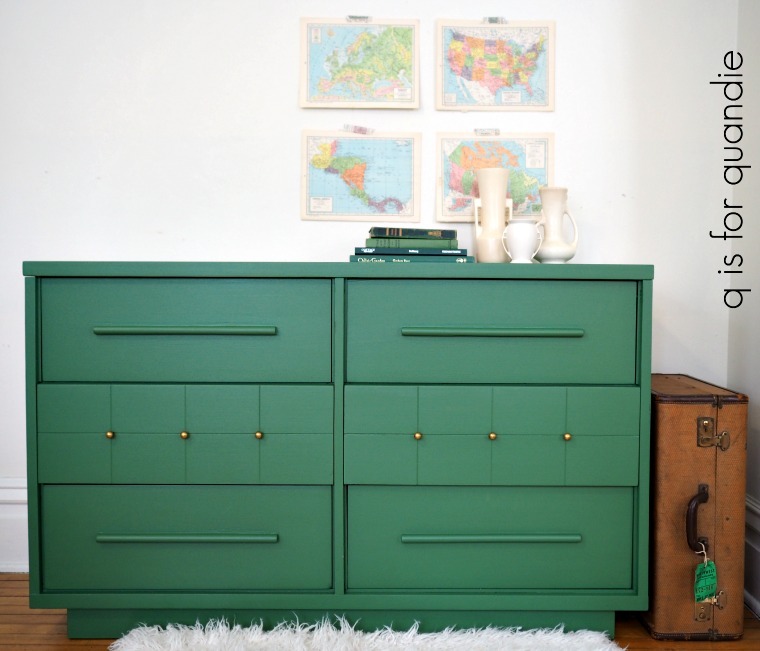 Love the piece and the color and dang those knobs! Details do make all the difference. This color would be gorgeous paired with royal blue, or navy blue too. You’re so right about details Victoria! Thanks Denise! I love this green, it’s bold without being too bright.